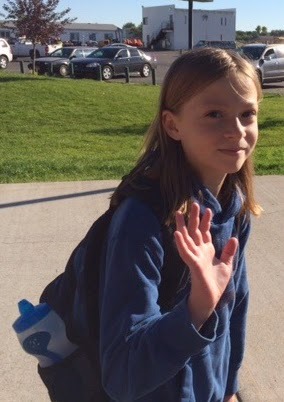 Zoe Bug is soooooo happy because we just granted her one of her most fervent wishes. No, we did not just buy her a horse. That picture fooled you for a minute though, didn't it? That's what I'm talking about. Boot Camp for Brats. Zoe requests it for her sister on an almost daily basis. And I finally caved. We shipped Stinkerbell off to Bratty Boot Camp on Monday, and Zoe has been living it up ever since. I posted this picture on Instagram and my Facebook feed and one of my Facebook friends said that I was mean. I wasn't sure how to respond to that. In fact I was momentarily stunned and speechless. I was like "Have we met, because . . . ? Um . . . I'm mean." I expect that if you're my Facebook friend you know me reasonably well enough to know that about me. Or, at the very least, that I lie like a rug. And that's what I was doing. Although I like to call it embellishing my story. It's more entertaining that way. 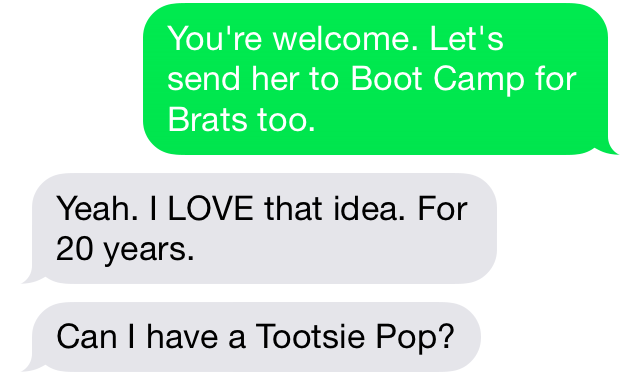 Really she's not at Bratty Boot Camp, but just camp, and she is having a ball. See, look at her smile. We went up to visit her tonight and she is having the time of her life. In fact, it seems we have completely slipped her mind because when she saw us she was a little taken aback. Once she had collected her wits about her, she informed us that we looked different. Apparently she had forgotten what we looked like. Which begs the question, did we really just send her off to Lord of the Flies Camp? I'm just sayin' because I think she would actually do quite well at a camp like that, being raised up by the Overprepared Boy Scout and all that. We didn't stick around too long because we were told in no uncertain terms that parents were to "Get Out!" by 9:00 p.m. so they could start their Staff Chase, and we would thus be in the way and would impede that process. However, before we left we did make the hike up the hill to snap a picture of the infamous Underwear Tree. The story behind this tree is that if you leave your under drawers laying about, they will end up on this tree. In other words, pick up after yourself. Or, as we like to say in our house through strategically placed vinyl lettering . . . Since Stinkerbell was going to be at camp this week, I told myself that I was going to finish her room. I haven't touched her room since Spring Break, and I never quite wrapped it up. In fact, I didn't even finish showing you what we did get done, and I know I promised daily updates. So, as an update, I painted her nightstand to coordinate with the upper portion of her walls. We put the Pottery Barn Kids bedding on the newly painted bed. By the way, I wasn't sure about the Hunter Safety Orange color, but I have to say, I really like it. It makes me want to eat popsicles. I had grand plans to staple red fabric onto the box springs instead of having a bed skirt, but that was a total flop of an idea because the box springs only had wood on one side. The other side is made up of a metal frame and springs. I tried to sew it onto that side, but I couldn't get the fabric to pull taut. So basically I wasted money and time on fabric for that. I ended up finding a fitted sheet that would go with our crazy colors. I wanted red, but the only red I could find came with a flat sheet and pillow cases, and I just wanted the fitted sheet. Target sells sheets separately like that, but they come in limited colors. Nothing wild and crazy like I was looking for. We also found this fabulous dresser at Down East Home. It's gigantic and it holds all of her summer and winter clothes, so we don't have to do the whole store and cycle with her seasonal clothes. Score on that one. Needless to say, I did not work on Stinkerbell's room at all this week, but I have made myself a promise that I will not start any new projects until I finish this one and a couple others. I have a really bad habit of starting projects and leaving them unfinished for long periods of time. I'm talking years people. That's it. It's not a gigantic list or anything too cumbersome, it's just not exciting stuff. I think I am my own worst enemy. The Stink has been begging me to finish her magnet board and hang it up. Zoe turned to her one day in her snotty informative teenager voice and said "Welcome to my world. It took her three years to paint my magnet board and I'm still waiting for her to finish my room." 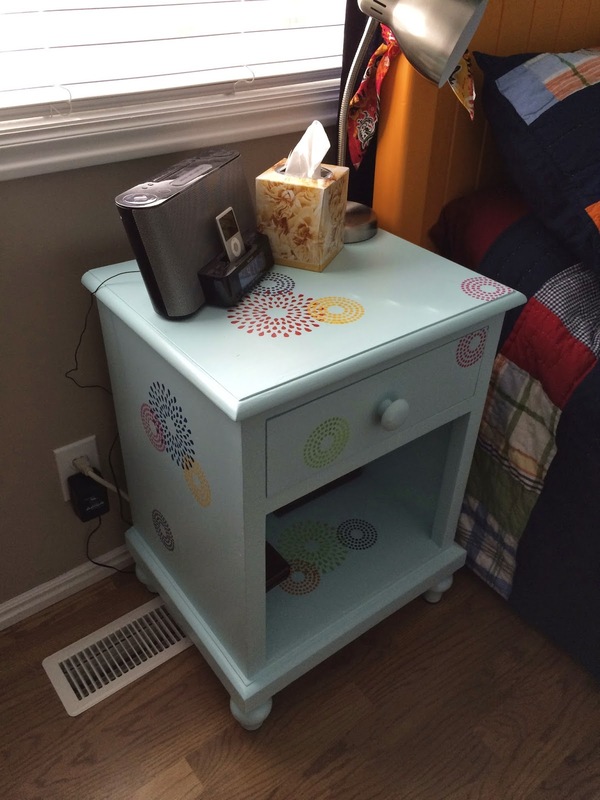 Where did you get the cute stencils for the bedside table and the walls? Jill, I found the stencils at Michael's. They are Martha Stewart stencils. I love the room and some people can't understand a joke. Glad she had a great time at camp. I think I started reading your blog when you were doing one of their rooms...but they were little kids! Great colors! And this is round three! One day I'll be done, I promise. I have the same problem. I just get so excited about starting a new project! And then life gets caught up, and the new project gets put into the closet. I have five projects that are on my to-do list...and I won't tell you how long they've been there. And Pinterest doesn't help any, would you agree? You can try using Velcro to attach the cloth for the bed skirt.